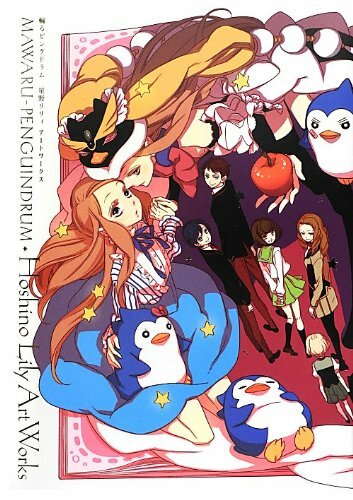 Here's the artbook for Mawaru Penguindrum the 2011 Japanese anime series. It's quite a thin book with only 88 pages. Soft cover with dust jacket. The artworks are in beautiful anime and manga style with nice colours with pink being used considerably. Some illustrations are pretty cool, especially those with the decorative frames from the first few pages. However, unfortunately there are parts of the wonderful double page drawings that fall into the gutter. It's mostly a character design book featuring the three main characters Kanba, Shoma, Himari Takakura and her transformation Princess of the Crystal. Other side characters have a smaller coverage. The second half of the book are character designs in sketches with commentary and notes. There are plenty of sketches. The character designer is Lily Hoshino (星野 リリィ) and there's an interview section with her, as well as one with the director Kunihiko Ikuhara (幾原 邦彦). Despite the rather thin offering of the book, the art is great and worth checking out.